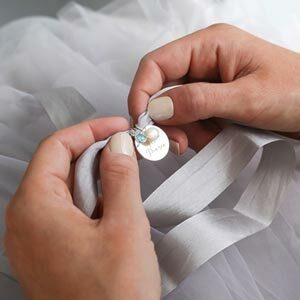 The Personalised Initial Disc and Micro Birthstone Bangle is a dainty 8mm disc attached to a fine bangle with a gorgeous micro birthstone charm. Our birthstone bracelet is a beautifully delicate disc on a fine wave bangle with a hanging birthstone charm, giving a modern and understated look. 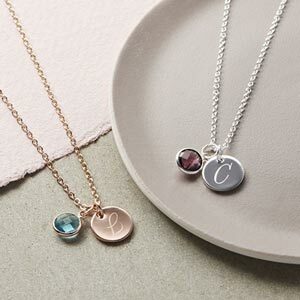 With the addition of a personalised disc charm with a script initial and choice of birthstone charms, this bracelet makes the perfect gift for a loved one or as a very special treat for yourself. Personalise your bracelet with an initial of your choice which can be lovingly engraved by our studio.